Also known as the Druid’s Altar, Drombeg Stone Circle is one of the most popular archaeological sites in Ireland. The stone pillars are arranged in a mysterious ring in the green rolling countryside in County Cork. Want to discover the history of the site and see it for yourself? Here is how to visit Drombeg Stone Circle. Drombeg Stone Circle is an archaeological area composed of 17 large stones staged in an eerie ring. Because the monument is thousands of years old, there is little that can be fully confirmed about the history of the stone circle that is found in West Cork. The circle is sometimes called the Druid’s Altar because some believe that it was a place for ceremonies. Excavations around the stones uncovered cremated bones and other objects that indicate it was used for a burial. Other theories about the site suggest that two of the 17 stones are staged to represent male and female energy. Most intriguingly, one pillar has a notch in it that faces two hills in the distance. Each year on the winter solstice, the sun rises between the hills and hits the marked stone – but the alignment is not perfect so there remains some debate about whether the placement was intentional. Next to the stone circle are two stone huts and one is probably the remains of a fulacht fiadh, an ancient cooking place surrounded by hut dwellings. The communal cooking area likely dates back to the Bronze Age and consisted of a stone trough, hearth and well that was surrounded low rock wall. The cooking arrangement was an ingenious way to prepare large amounts of food for the people who lived in the adjoining huts while consuming the least amount of energy. The trough could hold around 70 gallons of water from the well. Stones heated in the hearth fire would then be rolled under the trough or placed inside to bring the water to a boil. The hot water could then be used to cook meat or other foods for several hours without needing to be reheated. While most evidence suggests that the set up was used for cooking, there are other competing theories which suggest that the archaeological site might also have been used as a bathing area (which makes sense given that hot water would also be needed in this case), or even for brewing. 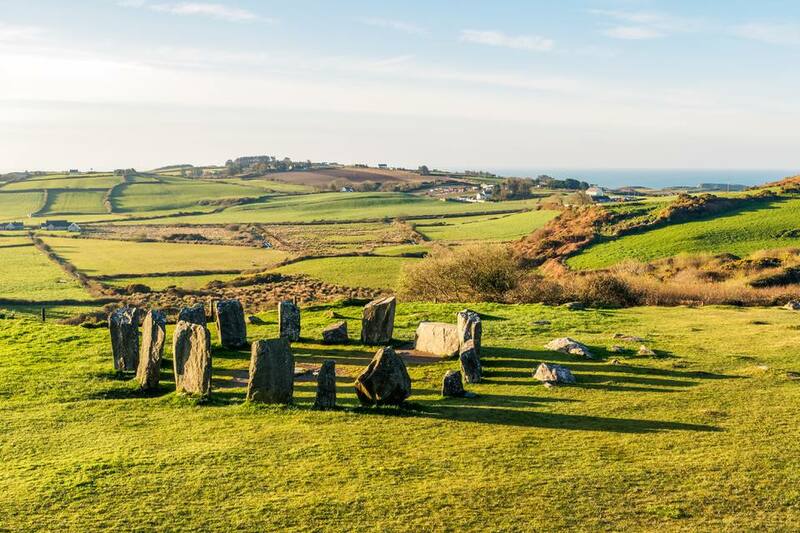 Drombeg Stone Circle is located in the countryside in West Cork and there is little else to do other than to walk through the site and enjoy the views. The stones are located on a slope that faces towards the sea. Drombeg Stone Circle is in Glandore, County Cork, Ireland. It is best reached by car or by organized tour bus. If you are driving yourself, take the R597 toward Glandore and then follow signs to turn towards Drombeg Stone Circle. There is parking, and it is a popular stop to make while driving along the Wild Atlantic Way in West Cork. Because the megalithic monument is located outdoors, it is always open. It is also free to visit. The best day to visit would be on the winter solstice because some believe that the stones were arranged specifically to capture the sunset on this day. However, the unique arrangement is fascinating on any day of the year. However, because the site is Ireland’s most famous stone circle, it is best to go early in the morning before the real crowds arrive. Those who are interested in slightly more recent Irish history can visit the Michael Collins Centre, a family-run museum outside of Clonakilty, Cork. The small museum is dedicated to the life of the Irish revolutionary hero and has a collection of memorabilia and artifacts, as well as life-size memorials dedicated to Collins. For a true pilgrimage, Collins was born in nearby Woodfield. Children will love the West Cork Model Railway Village that can also be found in Clonakilty. The miniature buildings have been designed perfectly to scale and recreate the West Cork Railway line that used to be operational in the 1940s. There is a working model train that runs between the itty-bitty villages that were once a part of the line—or hop abroad the “road” train to take a tour of the modern-day town. For a rush of adrenaline, stop for a zip lining session and an aerial obstacle course at the Clonakilty Park Adventure Centre. What Ancient Monuments Will You Find on the Hill of Tara?